A new type of congregation is emerging that combines religious practice with a distinctive element of local culture or community identity, such as artistic expression, missional engagement, table fellowship, or nature. Researchers Tim Shapiro and Kara Faris studied the key characteristics of these alternative faith communities in their book Divergent Church. Convergence, a worshiping community in Virginia, focuses on the yearning to connect spirituality with artistic and dramatic expression. The Wild Goose congregation in Floyd, Virginia, is centered around Appalachian culture, particularly its music. Simple Church in Grafton, Massachusetts, embraces baking and breaking bread as essential to the life of its community. For Church in the Square in Dallas, Texas, its life as a worshipping community is deeply entwined with its solidarity with the homeless and mentally ill. These unique, radically contextualized ways of being church cannot be easily replicated in different contexts. But their stories are an invitation to consider new and distinctive expressions of essential religious beliefs. Tim Shapiro and Kara Faris attach a name to this type of religious community — divergent church. Their recent book, Divergent Church: The Bright Promise of Alternative Faith Communities (Abingdon Press, 2017) examines the emergence of a new type of congregation that expresses tried and true religious practices in creative ways. A key characteristic of the 13 congregations they studied was the “church plus” factor. The authors explain that “divergent congregations juxtapose their expression of the Gospel with some aspect of their culture that matters deeply to the faith community.” This concern or interest doesn’t just augment their spiritual focus. It is fully integrated into their very way of being church. A key idea shared by the divergent churches profiled in the book is that faith community is about a way of being, rather than about a doctrine or denomination. 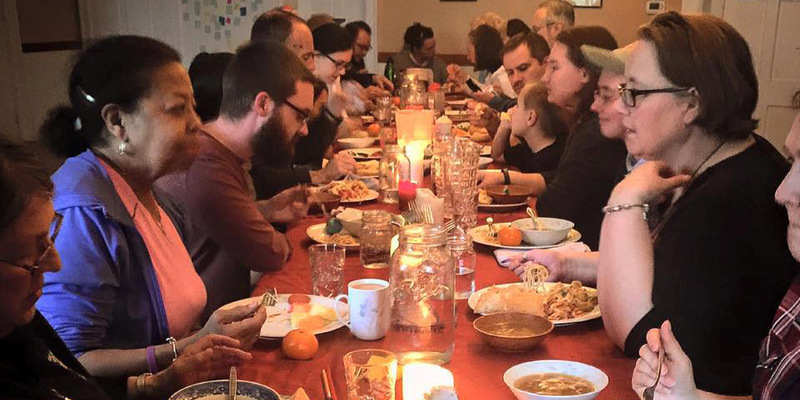 Accordingly, Divergent Church gives much attention to a set of practices that define and give meaning to these alternative expressions of church — the practices of building community, engaging in conversation, expressing oneself artistically, sharing meals, reaching out to the broader community, and extending hospitality. While these practices are found in traditional faith communities as well, in divergent churches they are “brought to life with a twist or an addition.” For example, Simple Church breaks bread in multiple ways, not just at the communion table or in the fellowship hall. Inescapably, these novel faith communities push against traditional ecclesiological understandings. Shapiro and Farris review the question of what constitutes a church from the legal, sociological, and theological perspective. But ultimately, the question isn’t whether these new ways of congregating fit into traditional definitions of church, but rather how they might expand the horizons of how we define and experience church. At the end of the day, the book affirms the creativity of the divergent churches, their ability to connect with people unlikely to be attracted to more traditional expressions of church, and perhaps most importantly their willingness to take risks for the sake of authentic community and honest encounter with the divine in everyday life. The authors caution that these unique, radically contextualized ways of being church cannot be easily replicated in different contexts. But their stories are an invitation to consider new and distinctive expressions of essential religious beliefs. They invite us to consider what creates religious meaning within our communities and how that might be expressed more authentically and creatively through novel practices. If nothing else, the authors conclude that the presence of divergent churches is a summons to loosen up, experiment, and innovate. Divergent Church: The Bright Promise of Alternative Faith Communities (Abingdon Press, 2017) by Tim Shapiro and Kara Faris is available at Cokesbury and Amazon. “PCUSA faith community takes flight, celebrating Appalachian music and culture.” Faith and Leadership. May 15, 2018.